Yamaha Motor to Exhibit at Japan International Boat Show 2010 - News Releases | Yamaha Motor Co., Ltd.
Yamaha Motor Co., Ltd. will display a booth at the Japan International Boat Show 2010, to be held from Thursday, March 4 to Sunday, March 7 at the Pacifico Yokohama exhibition site (Yokohama City, Kanagawa Prefecture). 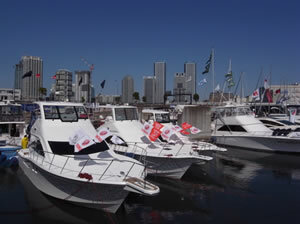 This year marks the 50th year since the start of Yamaha Motor's marine business. At the Boat Show, we will introduce our latest products and services built on technologies and know-how that Yamaha Motor has cultivated over the years. 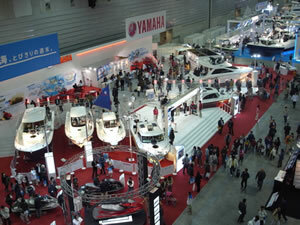 The theme of Yamaha Motor's exhibit booth will be "The Sea -- Unforgettable Weekends." In the indoor venue, Yamaha Motor will display mid to compact motorboats with a primary focus on new sport fishing models. Highlights include the FR-32 sport fishing boat and the SC-30 salon cruiser. Along with these boats, the booth will have displays of Yamaha's other popular marine products, including PWCs (personal Watercraft) and outboard motors. In the outdoor floating display area, Yamaha Motor will display its larger-class boats including the salon cruiser "EXULT 36 Sport Saloon," which was released in October last year. At the booth, visitors will also find information on Yamaha Motor's membership exclusive marine activity club "Sea-Style", our boat license courses and other service-related aspects aimed at familiarizing access to marine leisure and recreation to as many people as possible. There will also be customer events that provide a marine experience. In the indoor booth, Yamaha Motor will be displaying a new fishing boat (to be released on the same day) -- a dream come true for those who wish to fish in private boats, as well as the "FR-23 Active Sedan" a compact family cruiser that is gaining a lot of attention, the "FR-32" , a popular new-style fishing boat, and the salon cruiser "SC-30." In the outdoor floating display area, Yamaha Motor will display two boats from the premium "EXULT" series, embodying Yamaha Motor's highest level of quality in all aspects of design, performance and function. The new "MJ-VX Cruiser," with its great balance of performance, handling, and economy, as well as super-charged high-performance models "MJ-FZS" and "MJ-FZR" will be on show. The luxury model "MJ-FX Cruiser SHO" with unsurpassed array of high-spec features will also be displayed. Developed for high performance, lightweight and compactness, Yamaha 4-stroke outboard motors have won a strong reputation for durability and reliability. At this year's boat show Yamaha will display ten models (including concept models), including the 350hp F350A featuring the world's highest horsepower rating for a commercially available outboard motor. The membership exclusive marine activity club "Sea-Style" offers easy access to boats at reasonable membership fees in a network of 140 local marinas around Japan. In the 5th year since its launch, "Sea-Style" now offers PWC rentals. We aim to further satisfy our members by introducing fishing boat rentals at club rates. Information about boat license courses offered by Yamaha Motor will also be available. Videos and display panels will portray Yamaha Motor's booth theme "The Sea -- Unforgettable Weekends", presenting the appeal of marine leisure and Yamaha Motor's technologies that have enabled the introduction of a wide range of quality products to the market. Yamaha's Motor's activities for marine environment preservation will also be featured.